homeslice: Super Easy 3D Wall Butterflies! When I found out my second child was going to be a girl, I literally almost peed in excitement. That happens when your pregnant, it is no longer just a figure of speech. I wont even get into sneezing. Anyway, I could not wait to decorate her room. 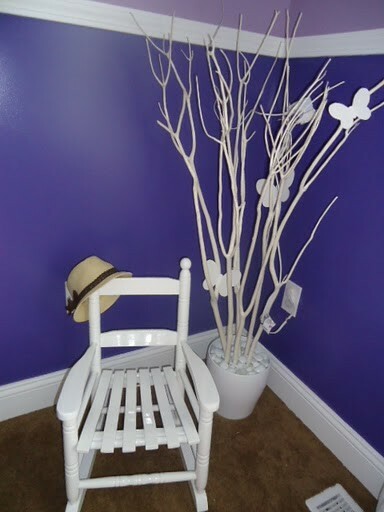 I absolutely love decorating, especially making awesome diy beauties. A commercial that was on quite often at this time was the ad below from LegalZoom. 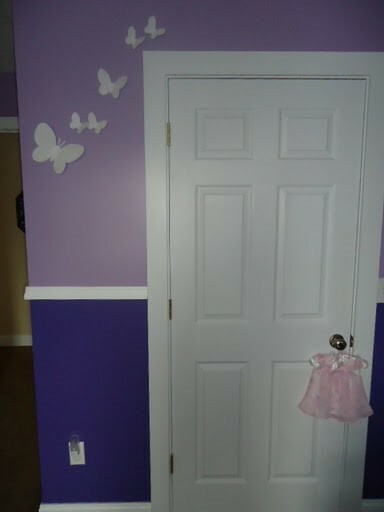 There is a room featured in the ad that is all purple with amazing butterflies on the wall. As soon as I saw it I knew, that is my babies room. I scowered the internet and stores looking for butterflies like these only to no avail. I could find metal ones and intricate wire and mesh ones. No, I wanted the LegalZoom butterflies! Finally after watching the commercial on youtube again for the umpteenth time (yes, Im crazy), I realized "well hell, I can make those on my own"! And I did. And they turned out fabulous. To start out all you need is to choose a butterfly outline, some cardstock paper, scissors, and some Command Poster Strips. All you have to do to choose the butterfly outline you like is search google images for 'butterfly outline'. You will get a ton of results and I am sure one that will suit your taste and needs. You can choose any ouline you like, however I do recommend one that is not too over complicated looking, something simple like this one. After you print one butterfly outline you can cut it out. Use that as a template with your cardstock. Outline the shape onto a piece of cardstock and do this for as many butterflies as you need. I recomend printing the butterfly in different sizes to really add dimension and a good look to it. I printed 3 sizes and only used the biggest one once, then mostly medium and small ones. 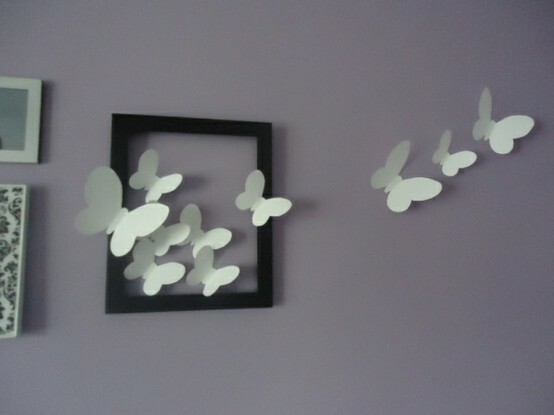 After you have cut out your butterflys you'll want to bend out their wings ever so slightly so you get a 3D effect on the wall, otherwise you will just have flat paper butterflies on the wall. Not as cute. They will bend easily and you dont have to bend too much, thats the great thing about cardstock. After you have bent your butterflies wings I would work out exactly where you want to place them on the wall before you move on to the Command Strips. Once you have a visual of where you want them to go, your ready to go. 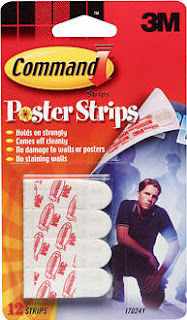 These adhesive strips are awesome. They wont mess up your walls, are removable when needed and they are so easy to use. You can get them most anywhere, WalMart, Target, etc. I personally cut mine in half before using them on the butterflies because they were wider than my lil butterflies bodies and I didnt want it showing on the sides. Once you have them placed on the backs of your butterflies body, just stick em right on up wherever you have planned out and waila! You have awesome beautiful 3D butterflies. This is one of the things I get the most compliments on in my daughters room and people are always surprised to realize they are made from cardstock on my own. They look awesome!